BJP President Amit Shah on Sunday said that it is certain that the Left Front would be ousted from power in the Tripura assembly elections in February and his party would come to power. 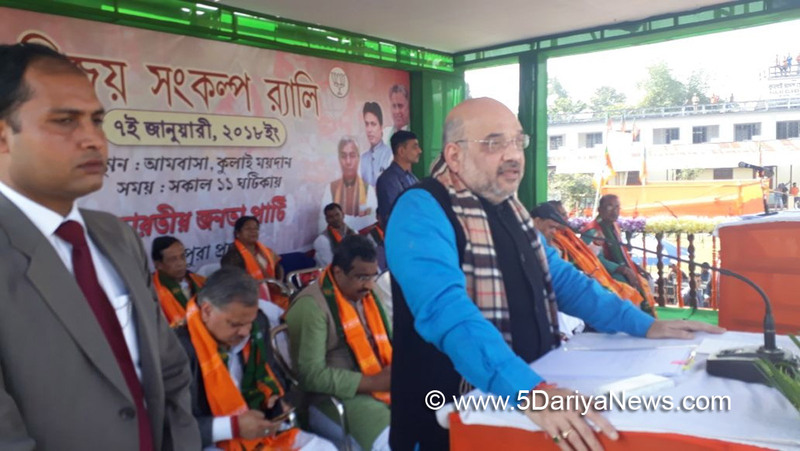 "Today's (Sunday) crowds have confirmed that the BJP government would certainly come to power in Tripura and the Left Front would be voted out in the next month's polling," said Shah, who addressed two pre-election rallies in the state.He said that Tripura would be transformed into a fully developed state by constructing high quality infrastructure and all modern facilities for education and health services.Lashing out at what he called the Communist Party of India-Marxist's (CPI-M) "politics of poverty and backwardness", Shah said that BJP would pave the rapid transformation of the state into a developed one through creation of employment opportunities. "Our Prime Minister's 'Mantra' is reform, perform and transform and the upcoming BJP government in Tripura would act upon these 'Mantra' to radically alter the profile of the state. Our cardinal principle is 'Sarv ka Saath, Sarv ka Vikas'and this would ensure equitable development for all communities of the state. "The genuine grievances of all sections of people would be resolved... the BJP government (at the centre) has already shown the sincerity to develop the infrastructure of the state by extending Broad Gauge railway line in Tripura," he said. Shah, accompanied by Bharatiya Janata Party's national General Secretary Ram Madhav, Assam Minister Himanta Biswa Sarma and state party President Biplab Kumar Deb had arrived in Tripura from Meghalaya capital Shillong.The BJP chief and other party leaders said they were overjoyed after seeing the presence of "record number of people's participations" in the two "Bijoy Sankalpa Rally" in northern Tripura's Ambassa and southern Tripura's Udaipur. "Many many years have given to CPI-M-led Left Front... Chief Minister Manik Sarkar could not deliver the goods, be it in the field of employment or be it basic infrastructure like road, electricity and healthcare. "The state is having over seven lakh unemployment youths while 37 lakh people live in the tiny state. Is electricity available in each village for 24 hours? Do farmers get minimum support price of their crops ? Nothing," he said.The BJP President also said those who are involved in the Rs 35,000 crore chit fund scams would be sent to jail once the BJP formed the government.Sarma, who is BJP's in-charge of Tripura elections, said that within the next one and a half month the BJP government would be installed in Tripura and then a new Tripura would be shaped and that would be a model state in the entire country.State BJP President Biplab Kumar Deb said getting most financial assistance from the central government, the Left Front government takes credit by giving some allowances to the people.